This morning's first chart is actually Private Payrolls (as opposed to nonfarm payrolls). Reason being: NFP accounts for Census Bureau hiring which creates massive, temporary spikes and drops in payroll counts every 10 years. Thus, if we look at long term charts of NFP, they're underlying message is corrupted by this artificial ingredient. Instead, we can just look at private sector payrolls ("private payrolls") for a more even-keeled idea of the trend. No matter which payroll count we're examining, it's apparent that we haven't seen an outlying drop (something below 150k) for nearly a year. The caveat is that April's initial reading fit that description, but was later revised up to 153k. 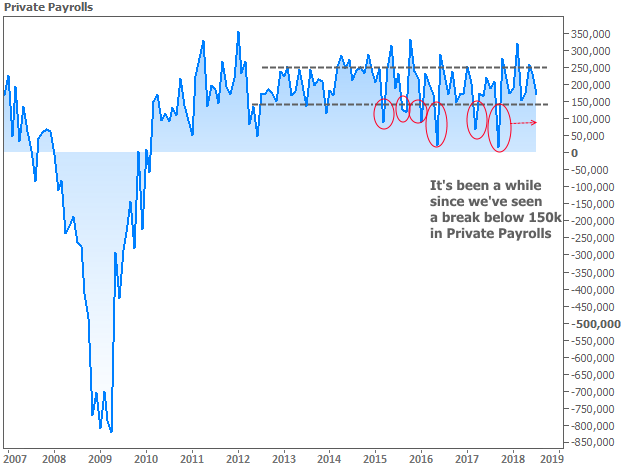 The point, however, is that we have several recent examples of payrolls pushing their upper boundaries but no great instances of troubling declines. In contrast, these were relatively more common in recent years. The conclusion is twofold. On the one hand, "maybe we're due." On the other hand, maybe markets would be quick to forgive the jobs numbers if they're unexpectedly weak today. We'll find out in a few minutes. 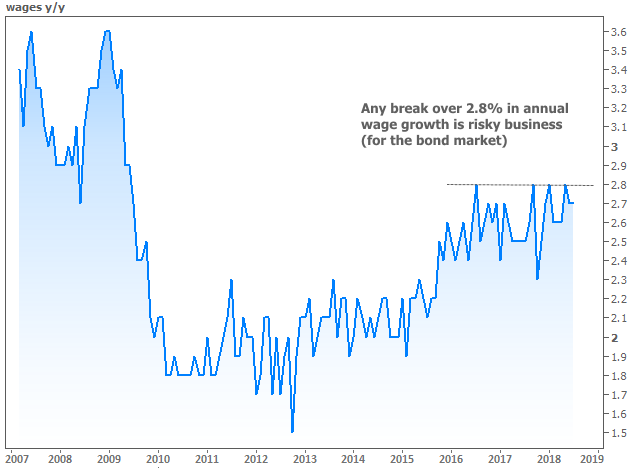 Less easy to forgive would be a break above the ceiling in wage growth numbers--especially with the Fed increasingly talking up the mysterious absence of wage pressures on inflation.